No, this isn’t my attempt at pop art but rather a collage of the pictures Jake Kilroy from over at Entrepreneur magazine sent me. I met Jake when he called to check facts for a story I was going to be quoted in and before I knew it we were chatting about color and Jake was conducting an impromptu interview about my business. It seems that his natural curiosity started the conversation but his journalist instincts soon took over and he wanted to explore an idea he had for a story of his own. It was great fun to talk to him and after our conversation and a couple of follow up emails he came up with so much to write about that the article spilled over into two days. Jake Finally Learns What A Color Strategist Does (Part I) and (Part II) Thanks, Jake! Jake’s girlfriend wanted him to go with her to her high school reunion and he wanted my opinion on which color would make the best impression. He sent me over a few pictures that he had colored in to show me what colors he was considering. YELLOW – You are letting the world know you are energetic and have high spirits. You will catch attention with bright yellow and it is the perfect color if you want to share your creative spirit and original thinking because you’ll attract curious listeners all evening, just like bees to honey. RED – Are you wanting to let your girlfriend’s former classmates know that you are popular and powerful? Then red is the way to go. It will also let them know that you like to have fun and are at the ready to take charge of just about any situations, even the reunion party if it isn’t as lively as you’d like it to be. GREEN – You’ll come across as a very social person, yet as someone that places value on status and may even have a tendency to talk about people or judge them by their appearance. Not a color that will put people at ease with you right away. Choosing a yellow-green might be better, as it says you are a high energy, adventurous person that is too busy for gossip. BLUE – Blue will have you looking cool and confident. It is a color that is naturally appealing and on you, with those blue eyes, it will be that much more attractive. Be careful, though, as blue lovers are susceptible to flattery, so don’t let the admiration of those former cheerleaders and beauty queens go to your head. Curious as to which color he chose? You’ll find the answer at the end of Part 2. 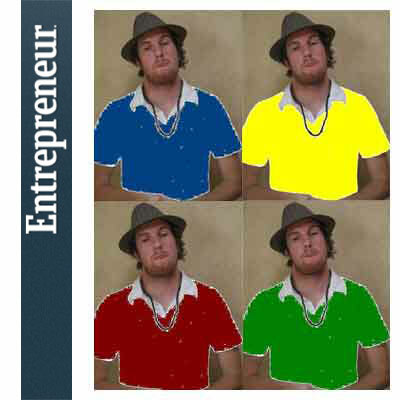 Jake’s entire story can be found on Entrepreneur magazine’s website.